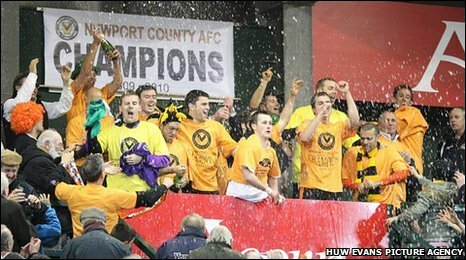 It was never going to be a case of if, but when runaway leaders Newport County would win promotion to the Blue Square Premier. 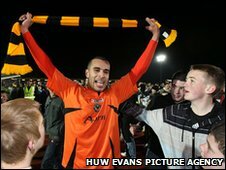 They finally achieved that goal on Monday night following their 2-0 victory over Havant & Waterlooville and became the first club in the English pyramid to seal promotion. 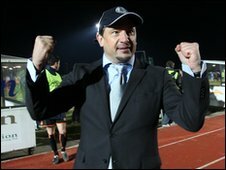 Dean Holdsworth's men are worthy champions, having topped the Blue Square South since September and never looked in danger of slipping up. They left their rivals standing, having won 27 games from 35, losing just once, scoring 78 and conceding just 17. Records are still there to be broken with seven games remaining though. The record points tally stands at 99, Newport are on 88 but can achieve 109; record wins is 30 and fewest defeats is four, while fewest goals conceded stands at 31. The Black & Amber army came out in force - a record crowd of 4,221, including some from as far away as Hertfordshire and Plymouth - to witness the Exiles reach their highest level since going out of business 21 years ago. Many arrived early to soak up the atmosphere, with some donning scarves in club colours bearing the word "champions" while others brought black and amber-coloured balloons. Holdsworth was presented with February's manager of the month award before kick-off and no doubt the manager of the year accolade will follow. County started brightly and the party almost began on four minutes when Craig Reid smashed the post, but you could sense a goal was coming. Danny Rose saw a free kick tipped over and then Sam Foley broke the deadlock heading home Jamie Collins' cross at the far post from close range. Cue celebrations. Among the chants of "championi" and "we are going up" was "Deano, take your hat off" referring to Holdsworth's trademark baseball cap - not sure it went with the suit! And the Newport fans have already decided which game they are looking forward to next season: "Wrexham, here we come" was the chant. Havant needed to score twice to wreck the party, but that was always going to be difficult against a side with such a mean defence. And Foley made doubly sure that was not going to happen on 67 minutes when he pounced first to a goal-line clearance from a corner to claim his 17th goal of the season and put Newport 2-0 up. 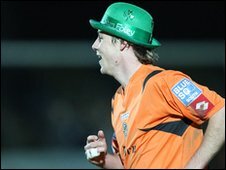 Now the party could really begin and he celebrated by wearing a green hat with his name on it, while Spytty, the club's mascot waved a home-made trophy. The rest of the match was pretty much a formality as the clock counted down. Holdsworth had time to give his 18-year-old son Bradley a hug by the dugout before they made a sharp exit from the pitch invasion at the final whistle. Then the party was in full swing. It did not take long for a "Newport County AFC, Champions 2009-2010" banner to be erected in the directors box. And that's where the players gathered to celebrate, spray champagne and sing with their supporters "We are the champions" before Holdsworth addressed the crowd. "Promotion was a dream last season and now it's a reality," said the former Wimbledon striker. "The players have pushed and pulled, have scored wonderful goals and they've dug in and worked hard." Top scorer Craig Reid dedicated the night to his mum Linda who died a short time ago from cancer: "This is to you mum, I love you," he said. So next season Newport will rub shoulders with the likes of former Football League sides Wrexham, Kidderminster and Mansfield. But before that, there is still some celebrating to do and records to break.